Marshall Class 5 all valve amp Made in UK Think Marshall Bluesbreaker in a smaller (and usable) package. These are really great amps and are perfect for recording, home use and small gigs! It’s has been gigged but in good condition! Marshall Class 5 Combo UK Valve. Condition is Used. Dispatched with Other Courier (3 to 5 days). Limited Edition Marshall Class 5 Amplifier. 2016 model in mint condition with manuals and original box. THIS IS A COVER FOR A MARSHALL CLASS 5 AMP OWNERS MANUAL . HAD IT CUSTOM MADE FOR MY AMP. BLACK COVER / GOLD PIPING. SOLD AMP WITHOUT COVER. FITS PERFECT. DIM 19" X 15" X 9". 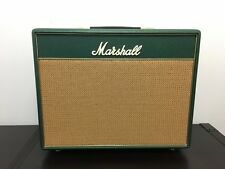 Marshall Class 5 1x10 Combo Amp! Up for sale is a cool and clean recent Marshall Class 5 combo in its original black tolex. This 5-watt little tone box is a great studio or small gig amp and truly looks and sounds amazing. Single EL84, single 10" speaker, and a no-frillsdesign. It's linearly adjustable from -2dB to -15dB. Just insert the Drop Box between your amp's output and the speaker and you're ready to rock! • Suitable for 4, 8 or 16 Ohms. • In / Out Jacks. • Powder-Coated Aluminum Housing. FREE Trial! Japanese products, I can help you! From Hiroshima, Far east island Japan! If you need ASAP!